Lessons From the Bean Patch – He Said What?! “In this world, nothing can be said to be certain except death and taxes.” We all know this famous quote by Benjamin Franklin. I might add one more item to his short list of certainties: hurt. Please don’t think I’m being negative. It’s just that the longer I live the more I see it…..the various hurts that impact lives and families. It seems that no one is immune from sometime, somehow, having to face hurt. And how we respond to those hurts is paramount to our happiness and even our health. Sadly, even Christians suffer hurts that are sometimes at the hands of others. Like I said, none of us is immune from hurt. As believers, we have a standard for dealing with hurt that goes far beyond any self-help book ever written. Of course, I mean scripture. But still, dealing with the pain of various hurts is very difficult…..and sometimes lasts for the rest of our lives. When forgiveness is sought by the offending party, and reconciliation is offered, then the healing can more easily begin. This certainly is the desired outcome for anyone who has or is suffering from the hurts inflicted by others. But what is one to do when forgiveness is not offered, and when the desire for reconciliation is rebuffed? Which brings me to my bean patch from last summer. Stay with me here. Those who know me know that I learn many lessons from my simple life of household and outside chores. So last summer, in June, Gary and I were gone for a week. We returned from our trip to find that our garden had grown tremendously. I saw right away that I had tons of green beans to pick. Well, not tons but it felt that way as I bent down to examine the vines. I had so much catching-up work to do after our trip that I was unable to make it out to the bean patch for a few days. Finally, one early morning, I was able to pick the beans. My five gallon bucket was full to the brim with all those beans. Soon I called my neighbor to ask if she wanted some, and she gladly said yes…..so I trotted over to her house with a bag of beans for her family to enjoy. It took me awhile to get back to my bucket of beans, which I washed carefully…..strung and snapped……and put on to cook. As I worked with my beans, I began to fear that they weren’t in great shape. And sure enough, when they finished cooking my fears were confirmed. I had tough beans. Not only did I have tough beans in my pot, but I had shared my tough beans with my neighbor. So I called her and I apologized for the inedible beans, after which I threw our tough beans away. I knew the problem: the beans had stayed on the vine way too long. As they lingered on that vine, under the hot Kansas sun, they toughened until they were of no use. 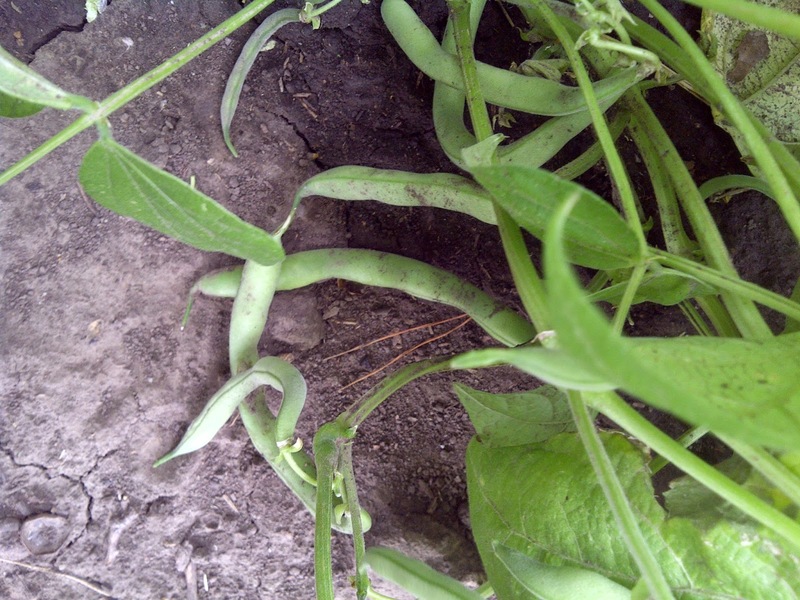 I needed to pick them days earlier, but I hadn’t done that….so my beans were tough and useless. This bean experience made me think of a situation that Gary and I have had…..and in some ways are still experiencing. It has to do with hurt, as I mentioned earlier. The hurt that is not handled…..is not dealt with properly…..and does not result in reconciliation. Over the years of our situation, Gary and I have learned some things…..some do’s and don’ts of dealing with unreconciled hurts. Maybe some of you can benefit from a few of the lessons that we’ve learned in the hard classroom of a hurting heart. FORGIVE: It’s much easier, I believe, to forgive someone when they do as Luke 17:3 says: when they truly repent and ask for forgiveness. But what is one to do when the offending party doesn’t repent….doesn’t ask for or seek forgiveness? We are to, simply, still forgive. God’s commands are clear, given for a reason. It is always our responsibility to forgive. But how do I forgive when the person who has done the hurting doesn’t ask for, or even seem to want, my forgiveness? I asked my brother, Dr. John King, about this issue. He reminded me that the word for “forgiveness” in the Bible often has the meaning of the word ‘release.’ It’s the word used of a fisherman releasing his fishing line…..casting it out and away from him. Likewise, I am to do some releasing. I am to release the offender to God. I do this over and over and over, maybe for the rest of my life. When I feel anger, resentment, old memories surface, when I see this person……whatever it may be…..I once again should make it a matter of my will to once again release this person to God. I also am to release my anger and my bitterness to God, realizing that these emotions are sin. I may be able to rationalize them, but they are still sin….and so I release them to God. I release any right I may think I have to get even, to gossip, to undermine this person. Do I fail at this? You bet! And that’s why I’m so thankful for God’s continuing forgiveness of my own sin. BE FAITHFUL: Gary and I could easily have walked away from our situation. Nothing was holding us there…..except God….and people that we loved. So we stayed in ministry and service, and we were so blessed beyond description during that time. Staying also gives the offenders more of an opportunity to make things right. And even beyond that description of faithfulness, and more importantly, is to simply be faithful to God. Don’t give up on your faith because others, especially others of faith, have brought such hurt into your life. Their actions should bear no impact on your own walk with the Lord. WATCH YOUR OWN HEART: Going along with the above is the admonition that David often wrote about in the Psalms: Search my heart, O God, and see if there be any hurtful way in me. Gary often told me, and our children, to not focus on the others but to focus on our own hearts. Each of us needed to search our own hearts every day, and let God deal with everyone else. If I’m busy concentrating on my own heart, and my own standing before God, I won’t have time or desire to be looking at anyone else. SERVE: Gary and I were, thankfully, already in some ministries that allowed us to serve those who had hurt us. Though at times it was very difficult to do that, we knew that God wanted us to serve and to do so with a glad heart. Those times truly aided in our healing. It’s just an example of how God’s ways often don’t make sense to us, but His ways work! Once again, my brother talked to me about Proverbs 25:21-22. There are varying meanings associated with this passage that talks about heaping coals of fire on your enemy’s head, but I love the picture that John gave me. He talked about how in those ancient times, when a person’s fire would die, they would often go to someone and ask for a coal in order to restart their fire. So what should a person do if his enemy came to the door asking for a coal? John said that God would want His people to give them not just one coal, but heaping coals of fire. I love that word picture! Pour a cup of coffee, prepare a meal, send a card, make a phone call……there are many avenues of service that can reach out to ones who would least expect it from us. PRAY: Another way to serve and to bless those who have wronged us is to pray for them. Pray for them and for their families, not just for the situation in which you find yourselves with them. And pray for your own heart and attitude to be what God would want it to be. DO NOT DELIGHT IN HARD TIMES: One early morning, Gary came upstairs from his study and told me about a verse that God had impressed upon him. The verse is Proverbs 24:17: “Do not rejoice when your enemy falls, and let not your heart be glad when he stumbles.” Gary felt strongly that he and I both needed to be careful to not ever rejoice if any bad things happened to those who had wronged us. There have been times that God has reminded me of that verse, and times that I have prayed for these as they have faced struggles, instead of delighting in their hardships. GUARD YOUR MIND AND THOUGHTS: In Philippians 4:8, Paul gives an extensive list of things upon which our minds are to dwell. It’s painful for me to read that verse because I see how often I have failed…..and fail daily…..to follow its admonition. I believe this is especially true….the part about failing….when your heart is hurting and you are wanting to be vindicated. I need to constantly remember that God will do any vindicating that is necessary, and that I am responsible to guard my thoughts. Unresolved relationships can eat away at our souls like an acid. Solomon warned us in Ecclesiastes 11:10 about this. “Remove vexation from your heart,” he said. Another version says, “Remove grief and anger from your heart.” In other words, quit dwelling on all that grief and anger. Continually dwelling on those hurts has been one of the hardest things for me to overcome…..and I won’t pretend that I’ve accomplished that yet. I’m better, but I’m still at times overwhelmed with thoughts that pull me down into pain again. And so I go back to that concept of releasing…..praying…..and watching my own heart. Over and over again, because the issues were not resolved and the relationships not restored. Gary and I were finally forced to leave our situation. We left…..but it has never left us. And I’m back again to the bean patch. Because Gary and I are still hanging on the vine. BUT…..we don’t want to be tough or bitter, like our beans were. How much better it would have been if the situation had been handled fully and quickly, like the beans that I harvested the week following the picking of the tough beans. The new beans that grew were picked quickly, and they were perfect……crisp and delicious. Well, the response we have is totally up to us. There are no excuses for our reaction to still being on the vine. We can choose to be tough, or we can choose to obey God’s principles and still be growing in the way He wants. To be better, not bitter. Remember how I shared my tough beans with my neighbor? I don’t want to share bitterness with others over our pain. I don’t want to be tough to those I encounter, or to my family, or especially to the Lord. I know it’s been a process for me, but I pray that God will use my pain to produce tenderness in my life and heart….not toughness. To not cast blame, but to take responsibility for my own actions and reactions. To speak truth, but not with hatefulness or anger. I had to throw away all those tough beans…..but not the lessons they have taught me. I know that these lessons will always be with me. I hope that my sharing them has helped you, too.